Do you let your limiting beliefs get the better of you? Do you often think what if you get rejected and everyone cat calls at you? Why have you been ignoring and running away from the gifts you have been blessed with? Will you allow your doubts and insecurities to win over you? If you answered "yes" to at least one of the above questions, then this book is just what you need to get informed, confident, and take the steps necessary to get exactly what YOU want out of your life! 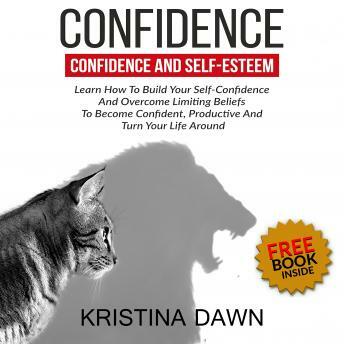 In this book, you will learn exactly how you can build confidence through some simple techniques. You will also learn how you can change the way you look at life and be grateful for what you have. The main purpose of this book is to help you come out of your cocoon and face the world. This is a shortcoming that you can easily overcome if you are willing to come out of your comfort zone. In this book, we'll be stressing on three strategies that will help you gain confidence and understand how you can change your life around. If you are focusing on your low self-confidence and limiting beliefs, then you will not be able to build self-confidence. You have to change the way you look at things You have to move past your limiting beliefs and weaknesses and focus on your strengths. Stop being a mouse when you are capable of being a lion. You are not doing the world any good by playing small. Be grateful for what you have and what you are capable of doing. Realise your strengths and focus on them. Discover your inner strength and focus on it. Instead of focusing on what you don't have, accept what you do have and embrace your strengths. Live your life fully and be energised. Stop complaining about your bad day at work and how exhausted you are. Instead, focus on being fully alive and drive your energy towards building your future. Do some mental exercises and listen to inspiring music to feel energetic and good about yourself. ! This book will touch on some of the practices that will help you lead your life with confidence. Whether you are at home or at your workplace, you will never again be faced with a situation where you fumbled for words or didn't have the courage to speak for yourself. What you can do now to begin? Are your limiting beliefs going to have a major influence on your life? If you cannot stand up for yourself, who will? What if I wasn't born with confidence?